The origin of the Chinese zodiac is unknown but the earliest examples from archeological finds are dated to around third century BCE. It comprises a series of twelve animals assigned to a cycle of twelve years. Unlike the Western zodiac, they are not associated with the stars. The twelve Chinese zodiac animals are however sometimes associated with the twelve “earthly branches” 地支, which are assigned in turn to the twelve directions starting from the north moving clockwise. In a variety of esoteric Buddhist tombstones found in Yunnan (around 12th-14th century), the zodiac animals are depicted with a kind of cosmic significance. Together with esoteric Buddhist mantras such as the Uṣṇīṣvijayadhāraṇī and Sanskrit seed letters to represent a pantheon of astral deities, the zodiac represents a kind of spatial totality not unlike its Indian counterpart, the dikpāla-s or the direction guardians which are often depicted also as a series. The sample below contains three zodiac animals at the bottom: Monkey, Rooster and Dog. The Rooster is represented by the earthly branch 酉 which is associated with the direction west. The traditional Chinese calendar is luni-solar. In other words, the dates are determined by both lunar and solar factors. In the case of the Chinese new year, it is set at the beginning of the month which contains the day where the Sun is at 330 degree, or about one month before Spring Equinox. The beginning of the month is usually close to the New Moon. In the case of 2017, the New Moon falls on Jan 27 but the Chinese New Year begins on Jan 28. Happy Chinese New Year of Rooster. The astral science was among the most developed bodies of knowledge in the ancient world. A complex and interrelated system of astronomical observation, astral rituals, divination and physiognomy was developed in Greece, India and China. While each civilization cultivated this knowledge along its own cultural trajectory and each system contained features unique to its own, there were moments when their paths crossed and ideas cross-fertilized and hybridized. This conference is concerned with the traditional lore of the cosmos and its evolution in South and East Asia, and how the astral knowledge of the “West” was received in the “East” in the pre-modern world. The event will take place in conjunction with the ISAW exhibition “Time and Cosmos in Greco-Roman Antiquity,” which all participants will have the opportunity to visit, as well as the evening exhibition lecture by Prof. Stephan Heilen on the same day. Described by the Indian scholar and Sanskritist P. V. Kane as “a problem not satisfactorily solved,” the introduction of a new form of astral science in India during the early centuries of the first millennium C.E. which resembles its Greco-Babylonian counterpart has been a heated topic in Indian historiography and history of science between Indian and Western scholars. Subsequent to the meticulous comparative analysis of David Pingree and his 1978 publication of a critical edition of the Yavanajātaka (“Genethliacal astrology of the Greeks”) dated to the second century C.E., a great number of questions concerning the origin and evolution of Greco-Indian astral science were clarified. However, with the recent discovery of new manuscripts and other materials, the issues appear to be far from being settled and some of Pingree’s widely accepted assertions now require serious reconsideration. 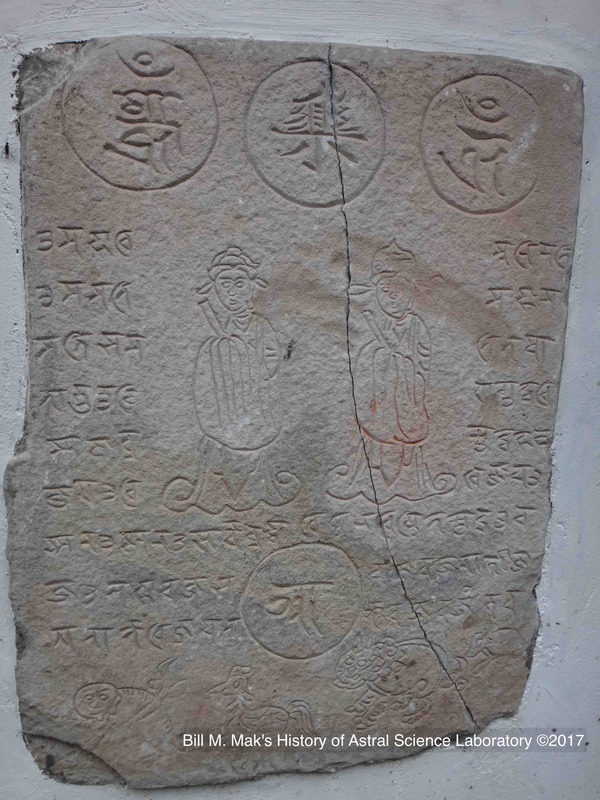 As it turns out, this Greco-Indian astral lore which impacted not only the South Indian subcontinent, but reached as far as Japan and Southeast Asia, was far more than just a local adaptation of a foreign science; it was part of a bigger picture of the circulation of knowledge in pre-modern Eurasia and a testimony of the ongoing negotiation and acculturation of ideas as cultures and traditions came into close contact with each other. Bill M. Mak completed his linguistic training at McGill University (B.A. Hons.) specializing in Sanskrit and East Asian languages and received his Ph.D. in Indian literature and Buddhist philology from Peking University. Mak held a number of research and teaching positions at Hamburg University, University of Hong Kong and Kyoto Sangyo University, before his current appointment as Associate Professor at Kyoto University and Visiting Research Scholar at the Institute for the Study of the Ancient World, New York University. Among Mak’s academic interests are Sanskrit Buddhist literature, historical Sino-Indian relation and Indian astral science (jyotiṣa). Since 2012, Mak has been invited to present over thirty papers and lectures in topics related to Sino-Indian and Buddhist culture and Indian astronomy, in India, China, Taiwan, Belgium, France, Germany, Italy and Japan.